On 20th April 2016 a group of campaigners squatted a council house in Avonmouth to stop it being sold. Six dramatic weeks later the squatters left, having successfully stopped the sale. In March 2016 the then Mayor of Bristol, George Ferguson, announced 15 empty council residential properties were to be sold at auction. Ferguson said the money raised would be invested in current council stock and 75 council homes then under construction. The sale of council houses while homelessness in Bristol is at crisis point was controversial. With a mayoral election on 5 May 2016 and all the other candidates opposing the sale there was also a question of democratic accountability. 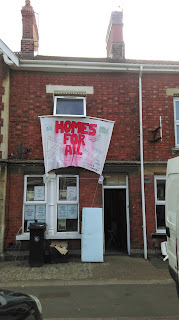 On 20th April – the day of the auction – 44 Richmond Terrace in Avonmouth was squatted to try and prevent it being sold. It was auctioned anyway and the buyer was not told the Council did not have vacant possession. The Council now had 28 days to gain possession of the house and complete the sale. They asked the police to evict the squatters. The police refused as the occupiers were not living in the building and were therefore not breaking any laws. The Council then did nothing, unable to make any decisions until after the mayoral election on 5th May. This was won by the Labour candidate, Marvin Rees, who had pledged to review council house sales. After the election the Council again asked the police to evict the squatters. The police again refused. The Council then issued a claim for possession in the County Court, with the hearing on 25th May. At the hearing the Council was awarded full possession entitling them to evict the occupiers. Unusually the court order specified the eviction had to happen before midnight on 1st June. The Council attempted to evict at 5.30am on Tuesday, 31st May. However they had completely underestimated the occupiers who had heavily barricaded the building and built a roof platform. It would take a substantial team of qualified and properly equipped climbing bailiffs to evict the squatters. The Council attended with about four contractors, a County Court bailiff and a council officer. After causing minor damage to the front door and waking the whole neighbourhood up with pointless banging the Council gave up on the eviction attempt. Meanwhile the squatters were in contact with the buyer who now wanted to withdraw from the sale. She’d found out the property required about £30,000 of repairs that the Council do not appear to have fully disclosed. Her solicitor had served a notice to complete the sale on the Council, expiring on 7th June (or thereabouts). After that the sale has failed and the Council has to return her deposit and pay compensation. On 1st June the Council’s court order timed out. They met with the buyer and agreed to release her from the contract. The sale had now failed. With the house no longer being sold and a new Mayor opposed to further council house sales the occupiers handed possession back to the Council on Monday, 6th June. A gap in new Government policy allows UK local councils to continue with impunity their hounding of Britain’s 60,000 Travellers, according to a report submitted this week to Deputy Prime Minister John Prescott. Chair of Britain’s recently established Gypsy Forum Cliff Codona, himself a victim of a racially-motivated eviction, says the long-awaited change in UK policy just announced falls far short of meeting Travellers’ needs.While pressing councils to designate land for future caravan parks, the latest advisory does nothing to end the vicious cycle of move-on operations and direct action evictions that are destroying the lives of thousands of families, says Codona. With delegates from forty other countries, Codona and fellow UK Gypsy representative Kay Beard, last month thrashed out a set of proposals at the European Roma and Travellers Forum which would outlaw direct action evictions and compel local authorities to pass planning applications or provide acceptable alternative sites. He has written to Prescott seeking an urgent meeting to discuss how new government policy can best be reconciled with the Forum’s view that local councils must not be allowed to go on using planning regulations as a smokescreen for ethnic-cleansing. Codona quotes his own case where Mid-Beds council turned down his plan for a model Romani heritage centre. Despite having earlier licensed the site for holiday caravans, the Tory-led council hired self-styled Gypsy eviction specialists Constant & Co to bulldoze the 14-acre property. More recently, Basildon council has voted to spend up to 5 million euro employing Constant to destroy 86 homes at Dale Farm, Essex, the largest Travellers’ community in the UK. Forum member Richard Sheridan has welcomed John Prescott’s proposal for alternative land to be set aside at Pitsea. But he points out that between l5 and 25 million euro in public money could be saved simply by leaving Dale Farm families where they are. Meanwhile, the Commission for Racial Equality has as good as said Tory leader Malcolm Buckley’s eviction plan is racially tainted. It has decided to back a judicial review of the Buckley plan sought earlier by Sheridan and other Dale Farm residents. Next month 40 yard-owners will mount an appeal against Basildon’s repeated refusal of retrospectivep lanning approval. The final decision rests with Prescott, who has so far limited consent to a two-year and one-year temporary extension. Forum members say they will continue their front-line campaign to plug the gap between long-term government aims and their immediate needs. As a first step they are seeking a moratorium on evictions and a ban on the employment of bully-boy outfits like Constant & Co., whom they accuse of burning and looting Gypsy property all over Britain. Café Francesca in Broadway Market, Hackney has been occupied for two weeks by local people to prevent its demolition by property developer Dr Roger Wratten and conversion into luxury flats. The occupation has received widespread press coverage, overwhelming local support and looks set to continue for some time. Hundreds of people have visited the café in the past 14 days bringing food, furniture and donations, over 60 people are on the shift rota and local residents associations have passed resolutions in favour of the occupation with offers of practical support. The Guardian, Evening Standard and others have carried features with a steady stream of journalists and film crews in the past few days. The court hearing on Friday 9th December led to a possession order being granted to Dr Wratten. However, instead of the usual 10-20 minute hearing, it took from mid-morning to 4pm for the judge to reach his decision, and the developers and their lawyers received searing criticism. The court heard that Kirrie Wratten, wife of Dr. Wratten and a co-director of his company Market House Ltd, had entered the café posing as a supporter in order to spy on the occupiers; giving a donation and signing their petition. This was described by the judge as ‘foolish’. One of Wratten’s many plans for Broadway Market was a 200 hundred seat theatre and in an interview with the Evening Standard Mrs Wratten said “I would have had a role in it as a guest director”. Since that particular application has been withdrawn her short appearance at Francesca’s is likely to be her first and last theatrical appearance on Broadway (Market). Wratten can now go to court again for an eviction warrant although this could take several weeks and an appeal may be launched before the 23rd December. Francesca’s has been successfully defended against eviction three times in the past, so even if it goes ahead this should not be taken as a sign of defeat. The police have re-opened criminal investigations into the original property sell-offs, and the council is reviewing the planning permission for Francesca’s, having admitted there are serious questions to be answered and referring it to Independent Planning Directorate for review. Tony Platia, who has run Francesca’s for 30 years, isn’t the only person in Broadway Market facing this treatment. Spirit, from the Nutritious Food Gallery, 74 Broadway Market, handed a cheque for a deposit on his shop to estate agents Nelson Bakewell on the day it was being auctioned off by Hackney Council, and at the end of the day discovered it had been sold to Bahamas based “Broadway Investments Hackney” for £15000 less than he’d offered. Little Georgia, part of the first wave of gentrification on the street, was recently priced out by Wratten and replaced one week later by a French bistro. Broadway Market, and Hackney in general, is at the sharp end of gentrification in London. It is likely to have six City Academies within the next couple of years, out of a total of only two hundred across the UK. Nearby Laburnum primary school was closed recently and will be replaced by a City Academy in 2006, to be sponsored and run by Swiss investment bank UBS. UBS also sponsors Hidden Art Hackney, which happens to have a significant presence in Broadway Market and has contributed to its redevelopment in terms of providing studio and retail space to ‘designer makers’ and developing the Saturday ‘Farmers STYLE Market’. As Londoners prepare for a heavy council tax bill to pay for the Olympics, which will be focused above all on Hackney, Haggerston Pool, five minutes walk from Francesca’s, and Clissold Leisure centre in Stoke Newington remain closed. East Marsh, part of historic Hackney Marshes and a major centre for Sunday football will be turned into a carpark for 2012. It’s unlikely that the olympics will provide significant improvements for people living in Hackney and the other affected boroughs, but developers and the construction industry stand to make a killing. libcom visited Francesca’s this afternoon and conducted a short video interview with Carl Taylor from Hackney Independent, and local advocate and spokesperson for the occupation Arthur Shuter. We present the interview in quicktime format (30mb, 3 mins) and some photosfrom the café. The corruption and sell offs on Broadway Market and the rapid gentrification of inner cities around the UK is one of the most visible signs of the continuing decomposition of the working class under New Labour. Along with the mass sell-offs of council housing, highest ever levels of consumer debt, casualisation at work, the pensions crisis and many more symptoms of recent capitalist development, this constitutes a sustained and continuing attack on our living and working conditions which may lead to many more stories like Francesca’s. The occupation on Broadway Market provides a glimpse of the potential for resistance against the encroachment of capital and commodity society on our public space and free time. Although a handful of experienced political activists are involved, the overwhelming majority of people drinking tea each day in Francesca’s “haven’t done anything like this before” (letter to Hackney Gazette, Thursday 9th December). Although highly localised and borne out of the daily experience of life for people in and around Broadway Market, the occupation has been extremely visible in both local and national media and mobilised the support of hundreds of people in the area. Although the fate of Tony Platia’s café is far from decided, the relationships and experiences that are developing through this occupation should lead to a political climate in Hackney which can continue to resist the process of gentrification and social exclusion which is likely to accelerate as 2012 approaches. As struggles like this circulate around the country and internationally, it points towards the potential for a society where people have taken control of their lives collectively, with human need being at the basis of organisation rather than ‘market forces’. Father of eleven children John Ward shot at the door of a farmer’s house, beaten with a stick as he lay bleeding in a patch of nettles;shot again in the back while staggering away in desperate flight, and his body dumped over a wall. Horrific descriptions like this tend be expunged from official reports of anti-Gypsy violence. Complete statistics remain lacking, even in the latest OSCE survey, and racist murders of Irish Travellers such as that of John Ward last year in Ireland have yet to impact on European records. A new report by the Council of Europe’s Human Rights Commissioner contains only one figure for racist assaults: 109 attacks recorded in Slovakia in 2002. Roma and pirutne or Travellers, including the Pavees of Ireland, are dying in racially-motivated attacks at the rate of 230 a year – that’s more than two a week – according to figures released by Rudko Kawczynski, chair of the European Roma and Travellers Forum, which is due to meet in Strasbourg next month. Statistics compiled by the Roma National Congressshow that 1,756 Roma were killed and more than3,500 injured in over 10,000 registered racial assaults between l990 and l998 in the countries of easternand western Europe. However, as no systematic monitoring or reportingyet exists, says Kawczynski, the RNC study contains only those cases revealed through media items and NGO-generated data. Bad as the figures are, they may be well below the true total. Such words as ethnic-cleansing, even genocide,have been used to describe militia-led operations against Roma in former Yugoslavia, especially Kosovo and Bosnia. Neo-nazi killings in the Czech Republic, Slovakia, Serbia and Bulgaria, pogroms in Romania and police-sweeps in the Russian Federation, all colour the dismal picture of increasing suppression and persecution, painted on a background of mounting intolerance and open racism. Writing of the situation in the UK and Ireland,where thousands have been evicted from their own land and driven from traditional stopping places, I have been chided for likening Travellers to the victims of terrorist bombings. But as in Zimbabwe, the state and local authorities show no compunction in pursuing enforcement policies that include the bulldozing of homes and the concomitant wrecking of our children’s lives. Lip service is paid at the highest level to theright of Roma and Travellers to their own culture and way of life. But the practices really pursued in Britain can be judged from the fact that since the passing of the anti-Gypsy Criminal Justice Act in l994, Travellers have been merciless hounded and newly-arrived Roma ruthlessly detained and deported. In the past ten years, at a conservative estimate, local authorities have spent a hundred million euro on anti-Gypsy measures, including move-on operations and blocking of potential stopping-places. The “clearance” of the Romani-owned Woodside caravan park alone cost 1.6 million euro, while five million euro has been set aside for the intended destruction of Dale Farm, the largest settlement of its kind in Britain. Prime Minister Tony Blair on Roma Nation Day this year signed the book of condolence for Roma victims of Nazi genocide and present-day racism. Yet the UK’s anti-Gypsy budget is running higher than that of the entire EU funding for the Framework Programme for the equal integration of Europe’s Romani and Traveller communities. Ignoring the recommendations of his own planning inspector, Deputy Prime Minister John Prescott has in recent weeks refused families in Bromley and Sevenoaks permission to live, even temporarily, in their own private yards. This means eviction and the end of regular schooling for another twenty children, and places an adult in need of dialysis in peril of their life. With the death of Charles Smith, chair of the Gypsy Council, we have lost the first Romani commissioner on the UK Commission for Racial Equality. But under the legacy of Smith’s influence, CRE chairman Trevor Phillips has declared the decision by Basildon council leader Malcolm Buckley racially motivated. Phillips will apply in the High Court next week to join Dale Farm residents in their bid to obtain a judicial review of Basildon’s blue-print for the demolition of 85 homes and expulsion of 600 people, including l50 school-age children and a score of severely ill adults, from land they purchased and developed, on government advice, at a cost over a million euro. Dale Farm has become a vital test case and a symbol of resistance to the misuse of planning regulations by anti-Gypsy politicians like Buckley. It follows from the stance taken by CRE that should Prescott again withhold permanent planning consent for Dale Farm he would, for his endorsement of Buckley’s malevolent plan, share the ignominy of a racist tag. primary delegate Kay Beard, of the UK Association of Gypsy Women, intend to put a resolution forward at the ERTF session in Strasbourg calling for a moratorium on evictions and other forms of legalised ethnic-cleaning currently common not only in Britain but in many parts of Europe. A second proposed resolution from the UK representatives to the expected assembly of elected delegates from some 40 countries urges the ERTF to “encourage and promote” the celebration of 8 April as Roma Nation Day by hundreds of Romani and Traveller organisations in Council of Europe member states. This call to take the lead in the further mobilization Europe’s ten million Roma, on the occasion of the 35th anniversary of Roma Nation Day, is likely to find wide support among those delegates who are already bent on extending the role of the Forum beyond that of a mere consultative body. Call for solidarity FROM St. Agnes Place and the Kennington Play Project in South London. On Wednesday 23rd November 2005 at Brixton Town Hall, Lambeth Council will be holding a full council meeting. We want to discuss the future of St Agnes Place and the nearby Kennington Play Project. Their plan is to close the playground and knock down twenty one properties (52 54 56 58 60 62 64 66 68 70 72 74 75 77 79 81 83 85 87 89 and 91) in a £16m deal with London Quadrant Housing who want to buy the land. For more than 30 years, the squatters of St Agnes Place have formed one of Britain’s most distinctive communities and have established themselves as a positive part of the wider community. The Kennington Play Project has offered a safe open-access play facility for local children which is as in demand now as it was over 25 years ago when it opened. Once the council takes a decision like this, the likelihood of further land sales and demolition in the area increases. Where will this stop and where will the children who use the playground go to play? The demolition notice has already been served, and it is now a matter of time before they act on it. Lambeth Council has been trying to get rid of the residents of St Agnes Place for years – Councillor Keith Fitchett recently described them as ‘parasites’. This is the same man who is at the centre of a Council Housing fraud scandal which has recently cost £2.8m of tax payer?s money. Police fear this money may never be recovered and Fitchett may be forced to resign as a result. We are being expected to put our trust in a council which is knee deep in scandal and financial mismanagement. The meeting on the 23rd is your opportunity to make your views heard. We need to let Lambeth know that their plans are totally unacceptable and will have an extremely negative impact on the local residents. The more people we can get down to Brixton Town Hall the better. Please pass this information on to your friends and arrange to meet at 6:00pm. St. Agnes Place, Kennington, is London’s oldest squatted street. Two hundred people are threatened with imminent eviction and the twenty-something Victorian terraced houses are soon to be demolished. St. Agnes Place is a community. For over thirty years it has evolved into a stimulating, challenging and rewarding mixture of cultures with creative people and vulnerable people, from all over the world. St. Agnes Place is home to the Rastafarian movement in Britain. Bob Marley used the International Rastafarian Headquarters as a second home in the seventies. Many other former residents are now working as doctors and in other careers which were only made possible by the welcoming arms of the streets patron. It is indeed a unique community; nowhere else in London can there be found a street of such diversity, where people from multi-cultural backgrounds live together with such a degree of interaction and mutual support. Since the mid-seventies, Lambeth Council have constantly used the force of the law and avoided talking to the residents on a more personal level. Consequently the possibility of arriving at an amicable solution between the two parties has never been fully explored. Lambeth Council has stated in their recent determination to evict Saint Agnes Place that the residents have no legal defence in this case. But is not the right to enjoy the security and safety of your home a reason to oppose such an eviction? The Human Rights Bill says that it is. Lambeth Council are moving the eviction order forward with ruthless haste, before the residents can effectively protest or make their voice heard in the media. Should this eviction go ahead hundreds of people will made homeless during the cold winter months solely for profit. As of yet Lambeth Council have not responded to enquiries about their development plans following the eviction. Lambeth County Court yesterday gave in to the Councils demand to have the eviction warrant executed by High Court bailiffs and sherrifs. Also, permission was granted to execute the evicxtion on Sundays. That means, Lambeth Council could roll in every minute from now. The residents ask all former residents and sympathisers to rally for the survival of the community. Some people will leave their houses in the next few days. We need people to fill the vacancies and help to resist the greedy developers! Very important: Please send this on to other sympathetic media!!! IN Denmark the present right wing government wishes, with the support of the Danish people’s Party, to close Christiania under the guise of city renewal. We do not want Christiania renewed and thereby loose our rights in the area. Christiania has in the course of the last 31 years renewed and restored itself. We wish to preserve Christiania as an independent area which can be experienced by people from all over the world. Please sign our petition and forward this email to your friends. The first-ever talks with local government officials to take place at Dale Farm, the 85-family community threatened with destruction by Basildon district council, appears have produced a positive outcome. Residents’ spokesman Richard Sheridan has welcomed a proposal from Philip Hamberger, assistant to chief executive Bala Mahedram, to set up an inter-community public meeting at Crays Hill later this autumn. “We’re obliged to promote good community relations,” newly-appointed diversity consultant Fola Kudehinbu, told the meeting held at the home of resident Mary Ann McCarthy. (13 Sept). Mrs McCarthy said all the residents wanted was to be left in peace to enjoy the homes they had created on the land they had purchased. They wanted nothing from the council except a piece of paper granting planning permission. In response Mr Hamberger said he personally could not alter the decision made by the council to spend £2 million on an eviction operation. For now it was up to the courts. But whoever was left at Dale Farm, whether 20% or 50% of the present population, his purpose was to improve relations. He suggested that the council could help promote a better image of Travellers simply by using different language. For start, the word encampment should be dropped and Dale Farm described instead as a village. Dale Farm campaigner Grattan Puxon pointed out that on past evidence of the way bailiff company Constant & Co. operate, Basildon council would be breaking the law should direct action be ordered. In particular, he warned against the use of heavy machinery belonging to HE Services. Before the meeting, residents removed a barrier of gas-canisters, which had hampered letter deliveries to Dale Farm. They have been replaced by a steel-gate and barbed-wire, limiting access along the private road to authorised vehicles only. At a recent eviction (26 July) at Wickford, Essex,one of your bulldozers crushed the fencing on the property of Mrs Gilheaney, of Ash View, in an act of trespass that was in contempt of a High Court Injunction. We ask you not to further damage your own image by hiring out your machinery and drivers to Constant & Co, the “Gypsy eviction specialists”.